In these early days of virtual reality, Sony's new PlayStation VR seems like the ideal product. Facebook's Oculus Rift and HTC's Vive, which both debuted earlier this year, offer high quality, super-immersive VR experiences at steep prices. On the other end of the market, Samsung, Google and others are offering headsets powered by users' smartphones. Those systems are cheap - but also less immersive. With the PS VR, as it's knows by fans, Sony is promising something in between, a virtual reality system that offers experiences comparable to what you'd get with the Rift or Vive but at a much more affordable price. After testing it last week, my take is that Sony's new gadget is a real match for its higher-end rivals. But the PS VR also highlights just how far virtual reality still has to go to be a product with mass appeal. Sony's new headset works much like Vive and Oculus Rift. Like those devices, the PS VR has a built-in screen that you view through separate lenses, one for each eye. It has built-in motion sensors that can tell when you turn your head or raise or lower it. Also like those gadgets, the PS VR relies on an external sensor - in this case, Sony's PlayStation camera - to help tell where you physically are in a room and how you are moving around in it. Like them, it uses on an external computer - here, Sony's PlayStation 4 game console - to create the graphics you see on your screen. And it connects to that computer via a physical wire. 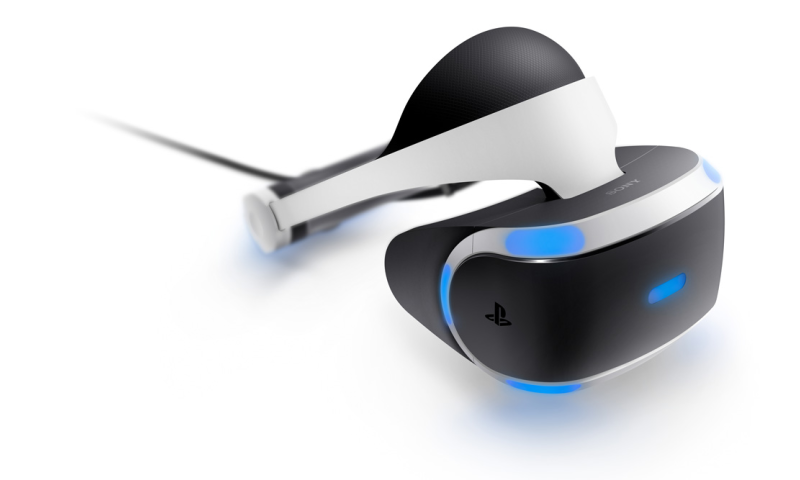 There's no way on the PS VR or the Rift or the Vive to enter virtual reality wirelessly. What makes the PS VR compelling - and what helps make it much more affordable than its competitors - is that Sony is marketing it as an accessory to the PlayStation 4. To use the Rift or the Vive, you need a high-end gaming computer that can cost $1,000 or more. Needless to say, few of us actually own one of those. But millions of us already own Sony's game console. And many of us also already have Sony's camera and its Move motion controllers, which you need for the PS VR system. Even if you own don't any PlayStation products and have to buy an entire system from scratch, you'd still end up spending only a little more than you'd spend for Rift or Vive - without the PC you need to run both systems. Despite its lower price, PS VR offers a very similar experience. On paper, its specs fall somewhat short of its rivals - its screen is a bit lower resolution and the angle of view is slightly narrower. But you really can't tell that when you put on the headset. You still get a high-definition picture. And the PS VR's refresh rate - an important factor in preventing motion sickness and maintaining virtual reality's immersive illusion - is 90 hertz, equal to that of its rivals. When I turned my head or moved around, the display reacted instantaneously. One point of strength for the PS VR is that you already have dozens of virtual reality games to choose from. The company is expecting some 60 virtual reality games for the system by the end of the year. Because of Sony's strength in video games and its relationships with major game developers, you'll likely see many more in the future. Among the early offerings are a virtual reality spinoff from the "Batman: Arkham" series; "Eve: Valkyrie," a high-profile space combat game that previously was offered on the Rift and Vive; and "Battlezone," an updated version of a classic arcade game. I tested a handful of games. My favorite was "Batman: Arkham VR," in which you get to play the Dark Knight. You fire his grappling hook, throw his Batarangs and even wear the famous cowl - complete with the pointy ears. It was very cool. But as compelling as it can be to suit up as Batman, Sony's new headset has some significant shortcomings and limitations that can temper your fun. Even though the PS VR is less expensive than its rivals, it's anything but cheap. The headset alone costs $400. A bundle that includes the Move controllers and the camera costs a cool $500. Also, the gadget is difficult to set up. It's not a simple plug-and-play system. Instead, you have to connect seven different plugs, update the software for both the game console and the headset, turn the camera so it's pointed in just the right direction, and adjust the headset so that it fits just right. And it's not like you only have to do that once. Every time I put the headset on, I found myself adjusting and readjusting the straps and its position to make the screen clear; often, I couldn't get it to stay in the right position, so the screen was a bit blurry. Certain games also ask that you stand in a particular place or turn the camera in a particular direction, so it sometimes feels like you are perpetually re-configuring the system. As with the Vive and the Rift, the cords that connect the headset to the computer can be a pain to deal with. You have to worry about tripping over them or stepping on them. My daughter accidentally ended one VR experience when she inadvertently disconnected the headset by stepping on and unplugging a cord. That's not the only pain. For me, the right position of the headset was with it mashed up against my face, which was about as comfortable as it sounds. When I removed the headset, the lines it left on my face were similar to those football players get from their helmets. But that was often the least of my concerns. After one day of playing, I got such a strong bout of simulator sickness - which can be triggered when your eyes perceive your virtual body moving in a way that's not what your actual body is experiencing - that I had to lie on the floor and go to bed early. So, while the PS VR has a lot to like, it's important to remember that these are still early days for virtual reality and nothing on the market today is close to perfect. As for me, I'm probably going to hold out for the next version - or at least a big box of Dramamine. Likes: High-quality VR experience; dozens of available games with more on the way; more affordable than HTC's Vive or Facebook's Oculus; accessory for Sony's popular PlayStation 4 console and uses Sony's Move controllers. Dislikes: Pricey; difficult to set-up; headset uncomfortable to wear for long periods and difficult to position correctly; has to be wired to game console, which can be unsightly and hazardous; offers relatively few non-game VR experiences; can cause simulator sickness. Specs: 5.7-inch 1920 x 1080 pixel display (960 x 1080 per eye); 90 to 120 Hz refresh rate; 100-degree field of view. Price: $400 for headset alone; $500 for bundle including headset, PlayStation camera and two Move motion controllers.